The coming year will see the return of another female icon, one whose jet black bangs haven't graced the pages of comics in far too long: Bettie Page! This marks only the second time in history that Ms. Page has appeared in officially licensed comic books, following the short-lived series Bettie Page Comics in 1996-97. The Pinup Queen has certainly long been a staple in the comic book world, dating back to the 1980's when Dave Stevens based the Rocketeer's girlfriend "Betty" off of the iconic leading lady. Subsequently, Ms. Page was seen in the anthology series from Black Cat Comics, a limited pinup series, and lastly in Dark Horse's Bettie Page Comics written and illustrated by Jim Silke. 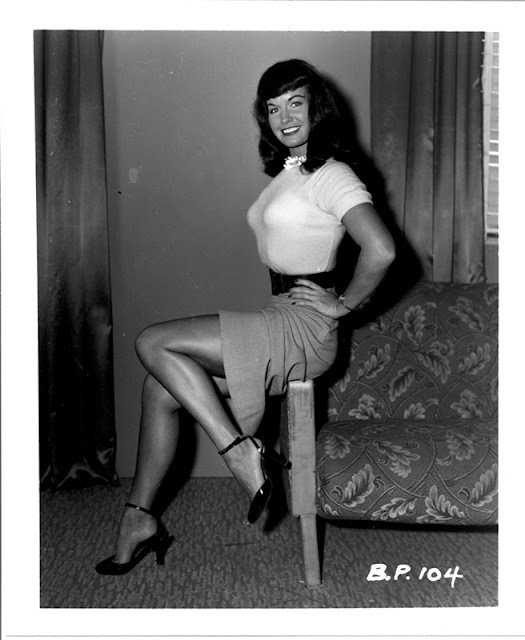 "Bettie Page set the world on fire in the 1950s, and her influence still burns throughout American culture today!" says Dynamite CEO and Publisher, Nick Barrucci. "Think about the vintage fashion craze, those instantly recognizable and ever-popular bangs, the pinup queen tattoos that are so playfully taboo! In our own industry, Bettie's striking look and wild spirit has taken shape in the pages of Rocketeer, in Watchmen, in the artwork of Joe Shuster, in the Batman villainess Poison Ivy, in DC Bombshells. We're proud to contribute to the enduring legacy of one of the 20th century's most unforgettable performers, and can't wait to deliver new four-color adventures to her loyal fans." Dynamite Entertainment will continue to roll out news on their upcoming Bettie Page publishing program, as well as additional licensed merchandise categories, in the coming months.